HALIFAX – Chief Joao Chaves, formerly a lieutenant at the New Bedford Police Department, officially took over as head of the Halifax Police Department from Chief Ted Broderick Tuesday, Nov. 13. The 53-year-old married father of a son spoke with the Express Friday in a wide-ranging interview where he asked almost as many questions about the town as were asked of him. The Dartmouth resident who will be relocating to the Halifax area within the year, was chosen by selectmen for the position from four semi-finalists in October after an exhaustive selection process. He was visibly excited to be leading the HPD and enthusiastically spoke about settling in and getting to know the town, developing a vision for the department, challenges that Halifax is facing and his background growing up. Chaves said that, under his leadership, the Halifax police will be known for treating people with dignity and respect as well as transparency. “I want the [officers] to treat people like they would treat their own parents. I don’t have time for guys with bad attitudes,” he added. But he doesn’t see the department needing any major overhauls. “I’ve come into a good, well-run place,” said Chaves. The Selectmen have previously stated that they, too, are pleased with how the department has been running, although Chaves does come with some new ideas. Some early thoughts mentioned include streamlining some duties and responsibilities so that officers can be more efficient and bringing new programs to Halifax Elementary School through the School Resource Officer. Chaves is still defining his priorities and is taking time now to informally interview officers so they can get to know him, and he can learn more about them and how the department functions. New Halifax Police Chief Joao Chaves in his office on Friday, Nov. 16. “It’s hard for a stranger to come in and take over,” he said. “I’ve been humbled by the positive responses I’ve gotten,” he said, regarding his arrival on the force. He described the many officials and townspeople who have been very welcoming to him. He has been meeting with department heads to introduce himself and hear their concerns, as well. Chaves spoke extensively about how the opioid epidemic has affected the town. Most crimes in Halifax are property crimes, he said, but the opioid problem may be worse than many think. Chaves said that although there has been a drop in the number of overdoses based on last year’s numbers, there has been an increase in opioid-related fatalities in town. “It affects all types of people,” he said of the problem, mentioning class and socioeconomic status as examples. Chaves said his extended family had also been affected by opioids. 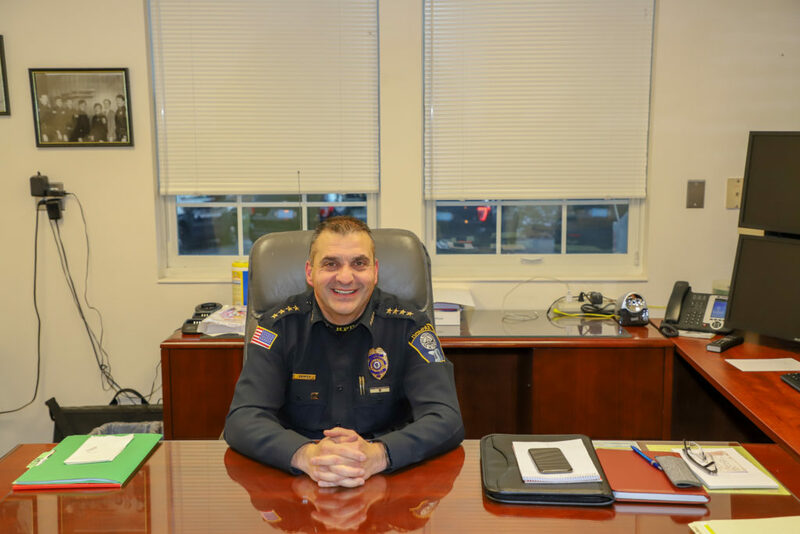 “This affects us all,” he added, and plans to continue the work that the HPD has done with Plymouth County Outreach to assist those struggling with addiction and their families. Chaves was born in Chaves, Portugal, a town that he joked was named after him, in the northern part of the country, near the Spanish border. The city is known for its ancient history and architecture, going back to the Roman period, he says. He said he grew up in a small village outside Chaves, under communism. His parents fled Portugal with him and his older sister, first to Spain and then to France when he was 6 years old. His father worked construction jobs while his mother cleaned houses to make a living. After he finished elementary school in France, an aunt who resided in Massachusetts sponsored his family to come here and they emigrated to New Bedford. “I was speaking French and Portuguese to my sister, and everyone else was speaking a foreign language,” he said. But a bilingual Portuguese/English program in his middle school had him speaking fluent English by high school. “It kind of forced me to learn English. When you’re a kid, it’s easy,” he said. Chaves says he still speaks Portuguese with his mother, and his son is minoring in the language at college, although they speak English at home. He still reads and understands some French. After high school, he thought he wanted to seek a career in law enforcement, and almost became a correctional officer. In a twist of fate, he got a call from the NBPD with a job offer and spent the next 31 years there. Chaves studied at the undergraduate and graduate level at Western New England University in Springfield. At the NBPD, he has held positions in everything from internal affairs to the major crimes division. His experience is extensive, according to his resumé, including several FBI management classes. Chaves said that as soon as he settles in, he’s coming into his first budget season as a chief, so that will keep him quite occupied. But for now, “I like to be on the road … I want to get to know the town,” said Chaves. He seems well on his way to doing just that.